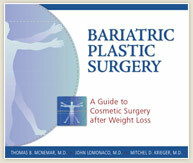 Post weight loss plastic surgery is in almost all cases about much more than pure cosmetics. After all, loose skin can hang uncomfortably and lead to chafing and skin infections. This is why many insurance carriers will cover all or a portion of the costs of surgery. Unfortunately though, the trend is for fewer insurance companies to cover these costs. To help you fit the cost of post bariatric plastic surgery into your budget, Dr. McNemar offers affordable financing options. He works hard to find the procedures that will fit your budget and provide you with pleasing results. After they've lost the weight, most people want to begin their cosmetic improvement plan right away, both for an improved appearance and increased comfort. Financing can help you get started sooner. For patients interested in financing their procedure, Dr. McNemar offers financing through CareCredit. His staff will work closely with you to help you fill out the necessary forms and get qualified. CareCredit offers financing for qualified patients. Convenient payment options are available. Financing your procedure can help you focus on preparing for surgery, planning for recovery, and enjoying your new look. Apply with CareCredit online or call us at call (925) 866-0177 in San Ramon or (209) 834-0626 in Tracy and we'll be happy to help you fill out a paper application.